First up, these are a treat! 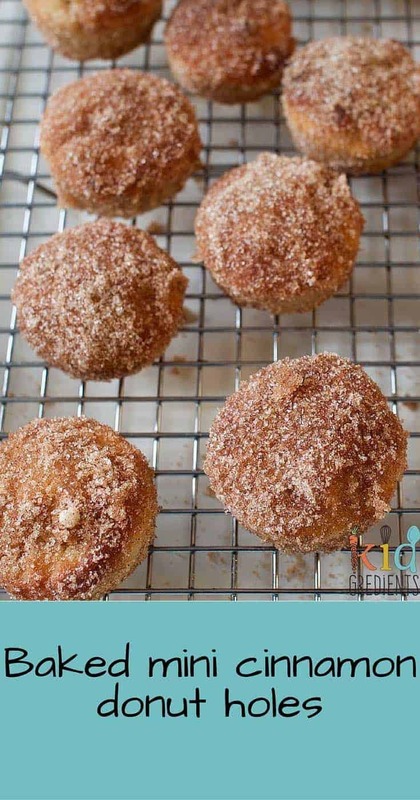 But they are a fun and easy treat to make with kids that allow you to make a baked treat that is like a cinnamon donut and that doesn’t have any nasty ingredients, or frying or even any egg. What’s so great about that? 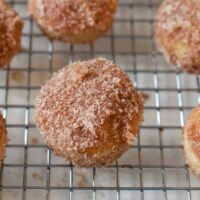 Well, the batter for these baked mini cinnamon donut holes can be eaten before baked! Or at least the spoon can be licked! Master 3 and I did measuring and pouring together, mixing and putting in the baking tray. He then waited very patiently (“are they ready yet?” “mum, I’m suuuuuurrrrre they are done!” “ready now?” “Ready yet?”) for them to bake for 15 minutes in the oven. 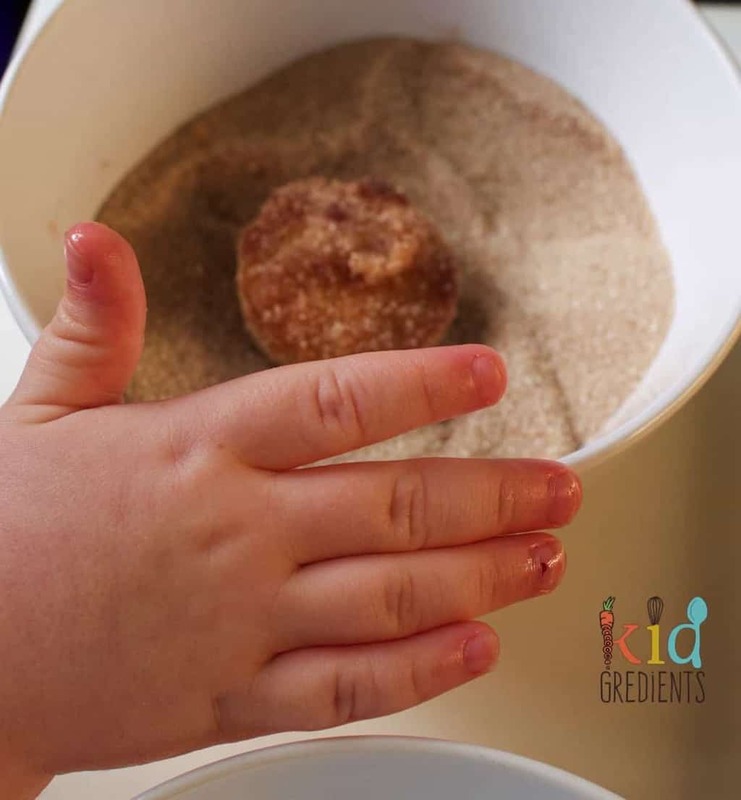 We then had to wait for them to be cool enough to handle so we could do the next bit- dipping in the coconut oil and rolling in the cinnamon sugar. But the best bit was the eating! But we’ve also put some aside for when big sister gets home from school. 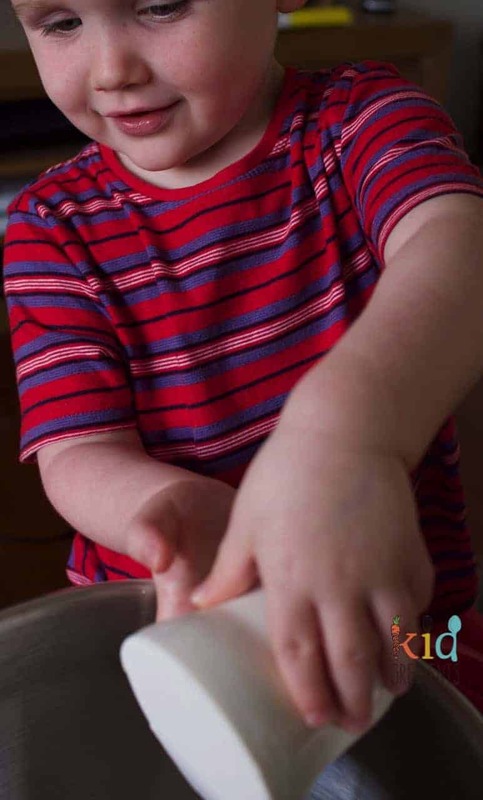 It’s pretty good to get your hands dirty with the kids in the kitchen. I know, this isn’t the healthiest of treats, but it is extra yummy and it is better for you than store bought options. So why not have a bit of fun with it? 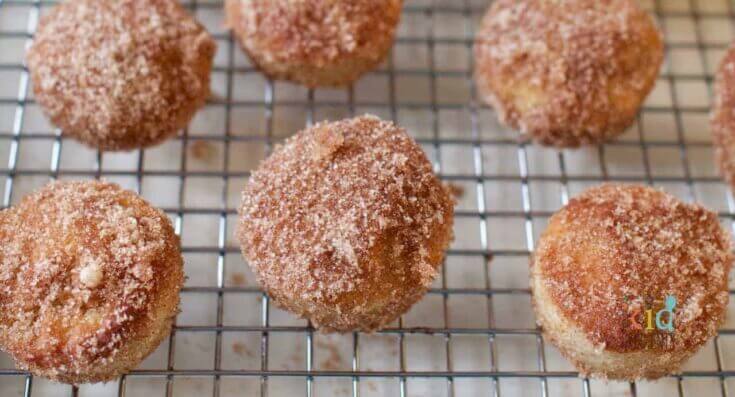 Baked mini cinnamon donut holes recipe that will leave you wanting more! Get the kids in the kitchen this Easter and make this yummy treat! Mix the dry ingredients and add the milk and coconut oil. 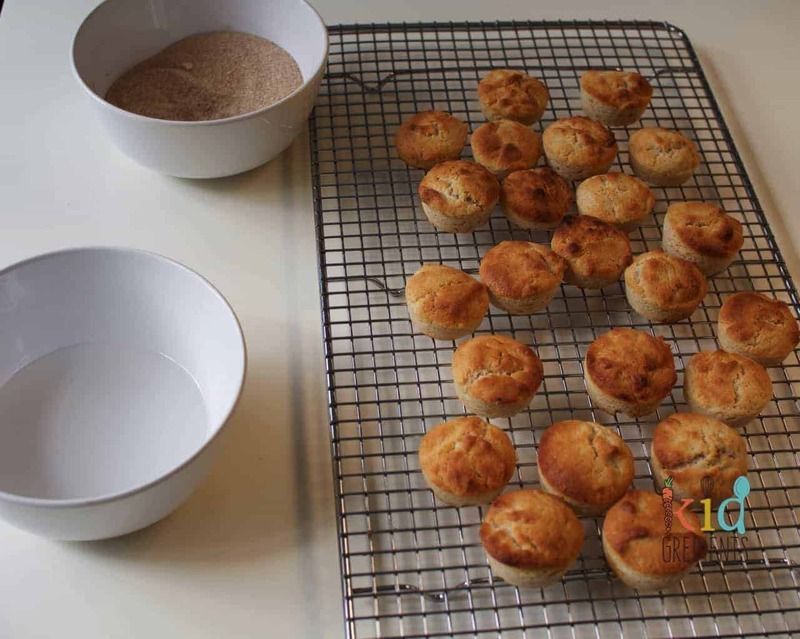 Using a silicone mini cupcake tray (or greased and floured metal one) half fill 24 holes with the mixture. Cool in the pan for 5-10 minutes or until you can handle them. Dip each cake into the coconut oil, then roll in the cinnamon sugar mixture. Serve hot or cool for later. Make sure you pop around and visit everyone! 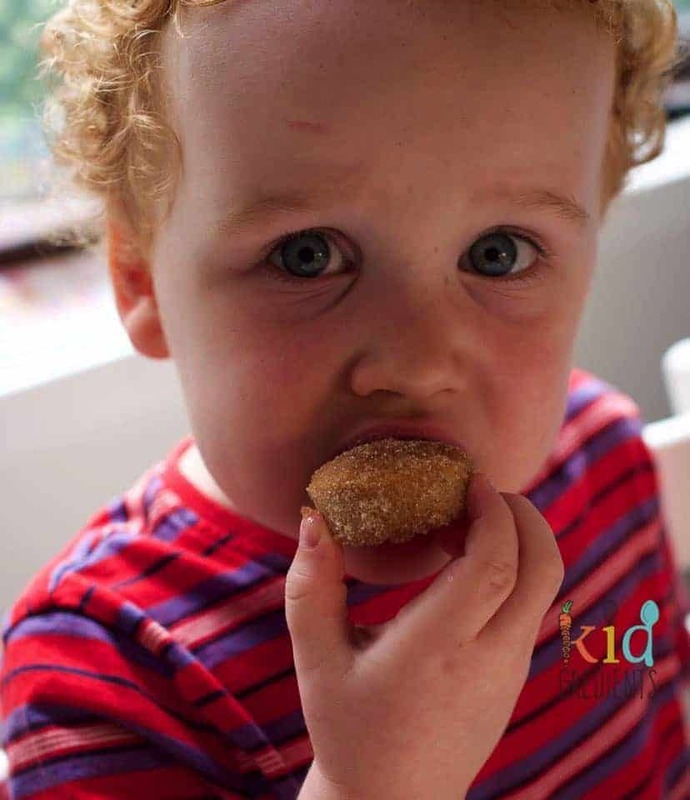 could you use normal white sugar instead of raw sugar? I just don’t have any raw sugar in stock at the moment. Ooh baked donuts!! I’m in! !